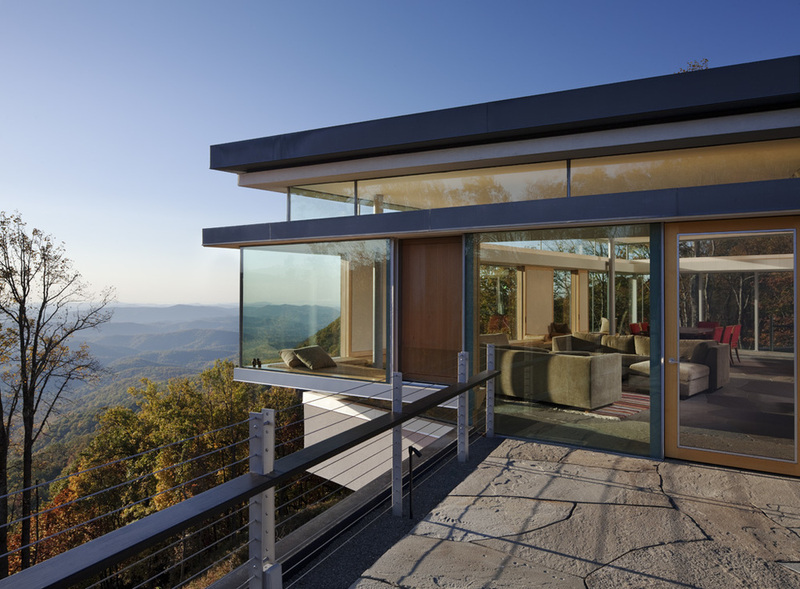 Located in the Blue Ridge Mountains, this 15,000 square foot retreat for a large family is discreetly sited on 35 acres with a 100 mile view. The house is understood as a series of connected pavilions stretching through a clearing in the dense forest and perched high above a seasonal stream. The pavilions break up the overall volume of the house while organizing the different programmatic zones: sleeping, living/dining and recreation. A central wood wall spine connects the zones. The sleeping pavilions are south facing with full height glazing to take advantage of passive heating while giving the inhabitants views into the forest. 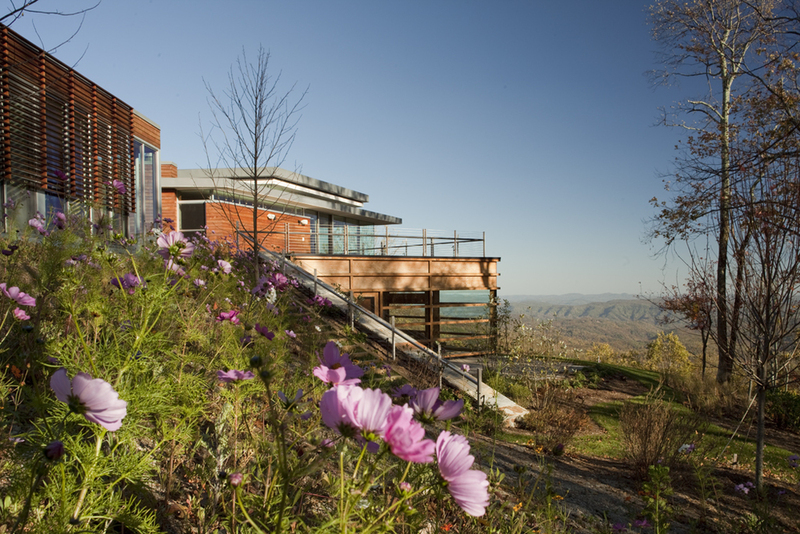 The recreation pavilion is built into the hillside below the sleeping and living pavilions in order to maintain views and outdoor space. The living/ dining pavilion cantilevers dramatically over the recreation pavilion and is wrapped entirely in glass and sliding panels in order to frame spectacular views and seamlessly connect indoors and out. The house is a candidate for LEED Silver Certification based on the incorporation of multiple sustainable building strategies. All of the framing lumber is locally harvested and milled. All millwork, doors, trim and flooring are built out of FSC Certified wood. All finishes including paint, sealants, glues and caulking are low or zero VOC. Nearly 80% of the roof surface is planted with local, drought-tolerant plants, as is all of the surrounding landscaping. Eighteen geothermal wells provide ground temperature water to a heating and cooling plant comprised of the highest efficiency heat pumps available today. Heat recovery units capture conditioned air before it is exhausted from bathrooms and the kitchen. Rainwater is captured from the roofs and stored in an in-ground cistern for use in irrigation. Low flow plumbing fixtures and dual-flush toilets are used throughout. Gray water from the washing machines is used to irrigate plantings inside the house. And finally, a 15kW wind turbine offsets nearly all electrical consumption for the house.